This great-tasting tea combines the delicious flavor of ripe apples and mellow chamomile. "We took our beloved, soothing Chamomile tea and added the taste of orchard-fresh apples to create this satisfying blend. Pure chamomile from Egypt and Mexico is combined with the juicy flavor of crisp apples and a touch of real honey to achieve the delicious sweetness of this comforting tea." 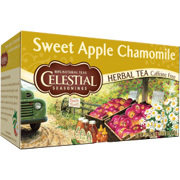 Chamomile, natural apple flavor with other natural flavors (contains soy lecithin) and honey. I really love this tea! I always run out quickly and I really wish they would make it in a really bigger size. Sweet Clementine Chamomile Organic Herbal Tea is shipped in a discrete, unmarked package. Orders are processed immediately and usually takes about 3 to 5 working days to be received. We do ask that you try it for 2 to 3 weeks to feel the full effects. Any information received is used only for order processing and shipping purposes. Your information, such as e-mail address, will never be disclosed to a third party.